Making a cardboard frame, base or form for your own handmade DIY wreath craft project may sound pretty simple but there are a number of things that you may want to consider. 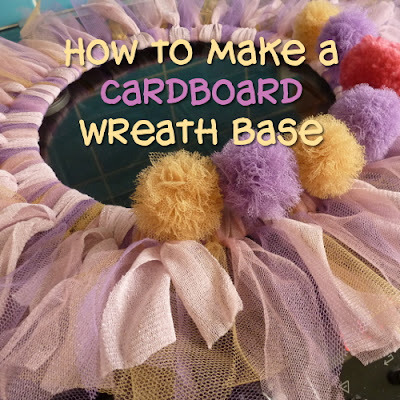 Learn all you need to know about how to make a cardboard wreath form or frame. I'll show you how to make a really large, circular frame even when you don't have anything large and round that you can draw around. 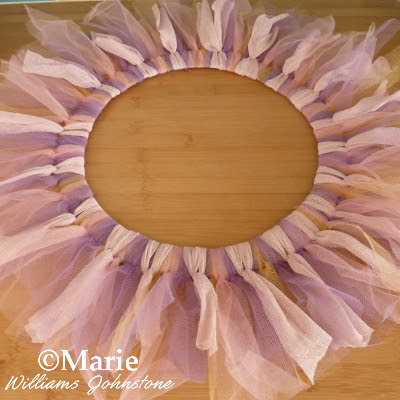 I'll also show you how to make a cardboard wreath form that is thick enough when you only have some thin card to start with. Come and see how it is done. I will answer all your frequently asked questions about making cardboard wreath forms and bases. I'll also offer up tips through this post since I've made many of my own cardboard frames by hand. It would not occur to me to go out and buy a wreath base when you can just use readily available and inexpensive materials that are normally sitting around the home. Use up what you have instead of throwing it away or recycling it. What Type of Cardboard Can You Use for a Wreath Form? The favorite type of cardboard I use for making wreath forms comes from large boxes. My favorite are the nice thick packaging boxes that companies such as Amazon tend to use. We save up all the large delivery boxes and fold them flat so I can use them for many DIY craft projects and decorations. Other sources of cardboard may include cereal box packets, the thick backing you get on drawing and paper sketching pads and even regular sheets of card. What if the Card is Quite Thin? If you only have the option of a thinner card that bends easily, that won't work very well for a frame or base which needs to be nice and sturdy. In this case, you need to sandwich several sheets of card together and stick them between each layer with glue. A wet glue will often make thin card wrinkle or pucker, a hot glue gun can leave lumpy areas where the glue hardens, so a spray adhesive (used in a well ventilated area) can often be the better option. What if the Piece of Card is too Small for a Wreath? If you don't want to make mini sized wreaths, it is possible to make larger sized frames if you're willing to tape sheets of card together side by side to make bigger pieces that you can cut your base from. You can use packaging tape down the front side of the join between two sheets and secure it better by also using this at the back of the join as well. Be aware that once you've cut your frame it will be naturally weaker where the join is, so I would advise wrapping packing tape around the whole ring as well once it is cut. So there are ways and means to create much larger sizes that you can use. 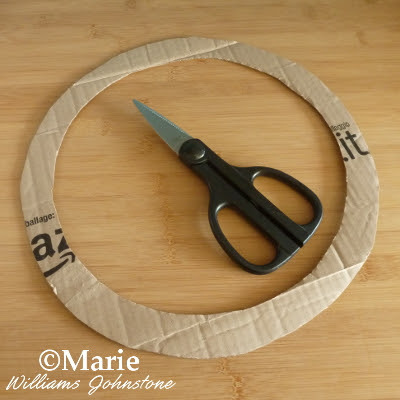 Once you've sorted the cardboard out that you will use to make your wreath form from, the next step is to decide how you will make your circles. You need two sizes of circle: one for the outside edge and one to make the inside edge so you end up with a ring shape. The hands down easiest way is to draw around any round objects that you have readily available. You may want to use a plate or a bowl. 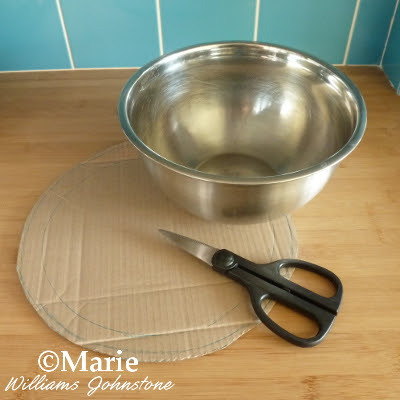 I normally choose my largest mixing bowl and use that to draw around to make the inner ring and then hand draw by eye the outer circle about 2-4 inches away to create the ring shape. A larger width of ring will make a sturdier shape but bear in mind that it may waste more fabric or tulle if you are planning to either tie tulle strips around it or wrap fabric around it to create your final design. Compasses are great at drawing circles but a standard one will not make a very large size to draw out the size needed for a wreath. The best way is to use the pencil and string method. Tie a length of string tightly around the bottom of a pencil and tie the other end to a push pin if you have one. Place the pin firmly in the middle of your cardboard and hold it down with one hand, pull the string taut and carefully draw out a circle. Adjust the string to the lengths needed to make your ring shape. You can also use this same technique with a simple tape measure by drawing a dot in the center of the card and measuring a set length away from the dot with the measuring tape and marking off the length as you move round. Move the tape measure around at regular intervals, keeping the start of it where the dot in the middle is and mark out a full circle of dots that you can then join by marking with a pencil. Once you've marked out your outside circle and your inside circle, you will need to cut all around the outside circle to make the outer edge of your frame and then cut away around the inside circle to form the ring shape. Cutting the interior circle is a lot harder, I try to snip a cut somewhere right in the middle with some sharp and strong scissors and then cut down to the circular line which I cut around. Should You Have a Flat or a Padded Wreath Base? A flat cardboard frame is fine. I managed to make the above tulle net wreath with that - that is it before I decorated it further with pom poms and embellishments. You may want to have a really thick and padded frame and especially if you are planning to wrap fabric around it rather than tying on strips of fabric as I have done above. You can easily make a DIY padded version by scrunching up plastic bags, tissue paper, bubble wrap or some kind of wadding on the front of the frame (or maybe back and front if it doesn't need to lie flat against a wall or door) and using loads of packaging tape to secure it all in place. Bear in mind that covering a padded version of a frame will use up a lot more fabric. Once your frame is made, you can wrap it with fabric, yarn, deco mesh or tie tulle strips around it which is what I normally opt to do. You can see how the tulle looks in the photo above. Making wreaths for celebrations and occasions is a whole lot of fun and also easy to do. Have a go at this and save money on not buying all the materials but using what you have instead. You can let me know in the comments below if you have any further questions.